Mexico City authorities enforced an emergency driving ban in the country’s capital. Smog alerts for Mexico’s capital have been issued for the first time in over a decade and in an effort to prevent the air pollution crisis from becoming worse, Mexico City authorities have enforced a strict car ban within the Megalopolis from April 5 to June 30 or until the rainy season starts. Last Wednesday, the ban grew even stricter as two out of every five private vehicles were ordered to stay off roads. Cars are blamed for contributing 90% of the pollutants in the city that result in ozone buildup. Mexico City is currently the fourth most populated city in the world. It is also one of the most heavily polluted. According to a news report from The Wall Street Journal, the Environmental Commission for the Megalopolis approximates that there are 10 million vehicles in the metropolitan area, which includes the Mexican capital and surrounding suburbs, where over 20 million people live. Initially, the car ban required vehicles to remain off the roads on certain days of the week, unless the car had an exempt sticker, which indicated that the car had undergone testing for smog and scored low on emissions. Essentially, every non-sticker car is banned from hitting the road one weekday each week and one Saturday per month until the end of June, which keeps about 20% of cars off the road each day. However, after an air-quality monitoring station located in the city measured ozone at 160 micrograms per cubic meter last Tuesday (well above the World Health Organization’s recommended 100 micrograms), a new car ban was announced by the country’s environmental commission, which forces twice as many cars off the roads (40%). Now, even vehicles with stickers that certify them as low-emissions will be banned on designated days based on their license plate number. According to researchers car bans often make air pollution worse in the long run. 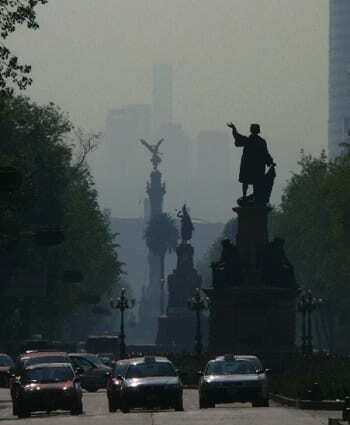 An energy researcher at the University of California Berkley, Lucas Davis, has spent time analyzing Mexico City’s similar attempts to combat smog in the past by banning cars. He found that instead of improving air quality, these program actually increased air pollution over the long term, reported Tech Times. Davis says one reason this happens is people are forced to take public transportation more frequently, such as buses, which are inconvenient, slow and in some cases have a reputation for being dangerous. In order to avoid this form of public transportation, people will find other ways to ride in a car. They may invest in a second family vehicle that has a different license plate number, take taxis, or use an Uber or a Lyft service. However, regardless of whether or not the car ban will be effective this time, one fact remains certain: air pollution in the Megalopolis is killing its residents. The think tank Mexican Institute for Competitiveness estimates that 1,823 people die prematurely in Mexico City every year (before the age of 65) due to the city’s heavy air pollution.